I wrote this piece quite a long time ago (and didn’t make any changes while posting it here), more specifically the days when I first got here. It has long been forgotten until… Until a few days ago when we were talking about going out for drinks one night. This was mainly because with all the organized parties and birthdays going on we haven’t exactly had the chance to go out, just to enjoy our drinks and this beautiful city at night. The question was where to go. We’ve been going around the city to explore new places for a while now but we realized that we haven’t been to Fiddler’s in a long time. So here it is! A post about Fiddler’s! -Come on, let’s go out! I’ve come to The Netherlands a month earlier than the beginning of the study so that I would have time to settle in to my new room and attend El-Cid, the introduction week of Leiden University. This gave me two free weeks before lectures start to explore the city and meet my future classmates. One of the many things you can do in Den Haag is to go out with friends, in this case mainly to Fiddler’s as it appears to me. Don’t get me wrong, there are a lot of places you could go to but what makes Fiddler’s special is that everyone from BAIS (BA of International Studies) tends to go there which means whenever you go there you will have someone from your course that you can talk to. This scene is one of the many things I love about being here and studying here. I was at a table with two Brits (one of them born in France), one German, one Romanian, one half Italian-half Australian, one international Dutch who has lived in many countries… and the list goes on. The only difference between those jokes and what I was experiencing was that it showed how wrong stereotypes were! This mix of cultures amazed me. It was just like Imagine. We, me and my future classmates, were a model of how life could be if the song Imagine came true. You may say I’m a dreamer but I’m not the only one. I do imagine that one day these lyrics, these dreams will become reality and it all depends on us. Stay well, stay international, stay together. 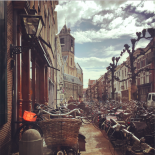 This entry was posted on October 28, 2013 by admin@theleidener in Ecesu, Leisure and tagged Ecesu Erol, Fiddlers, going out.